It's smart to have a few super-speedy dinner recipes in your arsenal, especially when they're as spectacularly delicious as these two new creations. 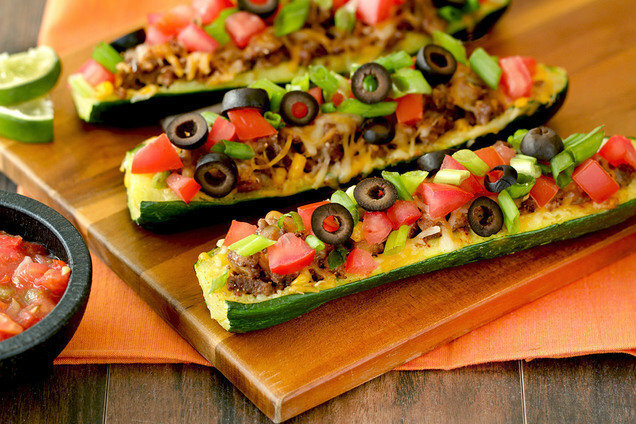 Both feature a low-carb superstar -- zucchini! -- and each one is ready in 25 minutes or less. This decadent dish is so satisfying! There are many great peanut dressings and sauces on shelves that are low in fat... Our latest favorite is Whole Foods 365 Everyday Value Organic Peanut Sauce! Pound chicken to an even thickness. Season with salt and pepper. Bring a large skillet sprayed with nonstick spray to medium heat. Cook chicken for about 4 minutes per side, until cooked through. Meanwhile, using a spiral vegetable slicer like the Veggetti, cut zucchini into spaghetti-like noodles. (If you don’t have a spiral veggie slicer, peel zucchini into super-thin strips, rotating the zucchini after each strip.) Roughly chop for shorter noodles. Transfer chicken to a cutting board. Remove skillet from heat; clean, if needed. Re-spray, and bring to medium-high heat. Add zucchini noodles and bean sprouts. Cook and stir until hot and slightly softened, about 3 minutes. Transfer skillet contents to a strainer, and thoroughly drain excess liquid. Re-spray skillet and return to medium-high heat. Return drained veggies to the skillet. Add sauce/dressing, water chestnuts, scallions, and 2 tsp. peanuts. Cook and stir until hot and uniform, about 2 minutes. 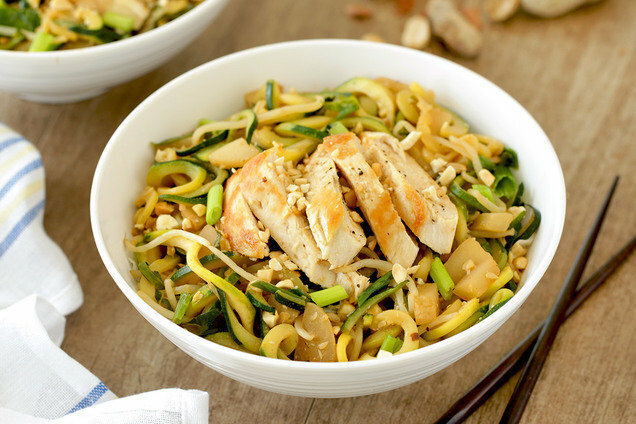 Slice chicken, and serve over noodles. Top with remaining 2 tsp. crushed peanuts. YES, these are as yummy as they look. Feel free to add the extra toppers... We finished ours with Trader Joe's Pineapple Salsa! Preheat oven to broil. Spray a baking sheet with nonstick spray. Slice off and discard stem ends of zucchini. Pierce zucchini several times with a fork. Place on a microwave-safe plate, and microwave for 3 minutes. Flip zucchini and microwave for 3 more minutes, or until softened. Pat dry. Let cool, about 5 minutes. Meanwhile, bring a skillet sprayed with nonstick spray to medium-high heat. Add beef, and sprinkle with garlic powder, onion powder, salt, and pepper. Add 1/4 tsp. cumin and 1/4 tsp. chili powder. Cook and crumble for about 4 minutes. Add corn. Cook and stir until corn has thawed and beef is fully cooked, about 1 minute. Cut zucchini in half lengthwise. Gently scoop out and discard the inside flesh (or save for another time), leaving about 1/4 inch inside the skin. Thoroughly pat dry. Sprinkle with remaining 1/4 tsp. cumin and 1/4 tsp. chili powder. Place hollow zucchini halves on the baking sheet. Fill with beef mixture, and sprinkle with cheese. Bake until entire dish is hot and cheese has melted, about 1 minute. Top with tomato and scallions. Hungry for More Healthy Meals in 25 Minutes or Less? Your friends and family members need today's recipes! Click "Send to a Friend" or forward them now.